The Chief of Army Staff, Lt. General Tukur Buratai on Monday warned that the Nigerian Army will deal decisively with local and foreign elements who are working to subvert the forthcoming general elections. 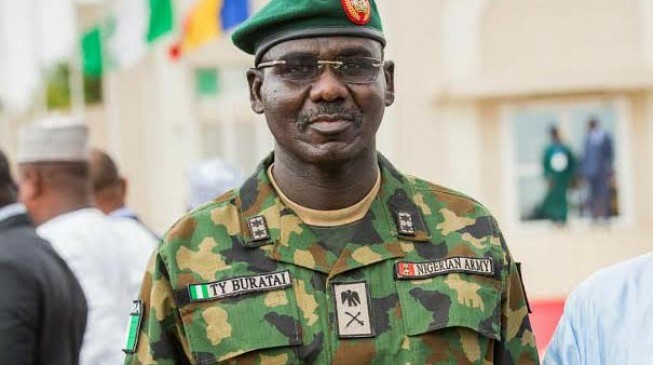 According to General Buratai, the Army has received information about plans by some unpatriotic groups within the country alongside some foreign collaborators to scuttle the peaceful conducts of the coming elections in some parts of the country. The Army Chief made the remarks while declaring open the Chief of Army Staff Operations Conference held at the Army Resource Centre in Abuja on Monday. The COAS said: â€œLet me at this point state that we have information of subversive motives by some unpatriotic groups aided by foreign conspirators to scuttle the peaceful conduct of the 2019 General Elections in some parts of the country. â€œWe hereby warn such detractors to immediately mend their ways. The Nigerian Army is working closely with the Nigeria Police and other security agencies to ensure an enabling environment for the good citizens of our dear country to exercise their civic rights. â€œIn this regard, GOCs and field Commanders at all levels are to deal decisively with any form of security breachâ€. Gen. Buratai who warned participants at the conference which comprise of General Officers Commanding, (GOC) Principal Staff Officers (PSO) and selected Commanders, said any army personnel who take side with any candidate or political party during the elections would be shown the way out of the service. Said he â€œOver the past one year, I have given very clear directives on the posture the Nigerian Army should adopt during the 2019 General Elections. The need for the NA to remain apolitical and professionally responsive in the discharge of its constitutional roles has been stressed. All Nigerian Army personnel must remain neutral, non-partisan and transparent in all their actions. â€œI need to reiterate that there will be zero-tolerance for any action and in-action by commanders at all levels that is deemed tilted towards giving undue advantage to any candidate, political party, ethnic or religious leanings to the detriment of the unity and integrity of Nigeria. â€œI urge you all to remind officers and soldiers under command to be guided by the stipulated Code of Conduct and rules of engagement in the discharge of their duties during the Elections. We will all recall some of the events of the 2015 General Elections which subsequently led to the sad exit of some fine officers who were found culpable. I therefore enjoin you all to impress on your personnel to avoid a repeat of such occurrencesâ€, Gen Buratai asserted. He said the Conference was aimed at reviewing the various military Operations going on across the country in order to address challenges and noticeable lapses, stressing the army is investing heavily in cyber security systems to enable monitor developments and capture trends of events as they are happening. The Army Chief further said â€œOur role in support of the nationsâ€™ democracy cannot be over-emphasized. Hence, this Conference will provide us the opportunity to review the conduct of Ex EGWU EKE III and to appraise the preparations so far being made by various formations towards the smooth execution of Op SAFE CONDUCT before, during and after the 2019 General Elections. â€œThe Conference will also afford us the opportunity to review recent events in Op LAFIYA DOLE and deliberate on how best to address some of the operational, tactical and administrative lapses. It is expected that this Conference will proffer solutions to some of the challenges in the theatre of operation with a view to stimulating and driving added impetus to the overall conduct of the operation. â€œI am glad to note that this Conference will also witness a presentation by the Nigerian Army Cyber Warfare Command on our latest effort at adapting web-based technologies for monitoring the operating environment especially during the 2019 General Electionsâ€.